I got one of those surprises no one likes to get. Monday was my "work late" day, so I arrived closer to 6pm than my normal 5-515. It was raining and the horses were all tucked in sheds. 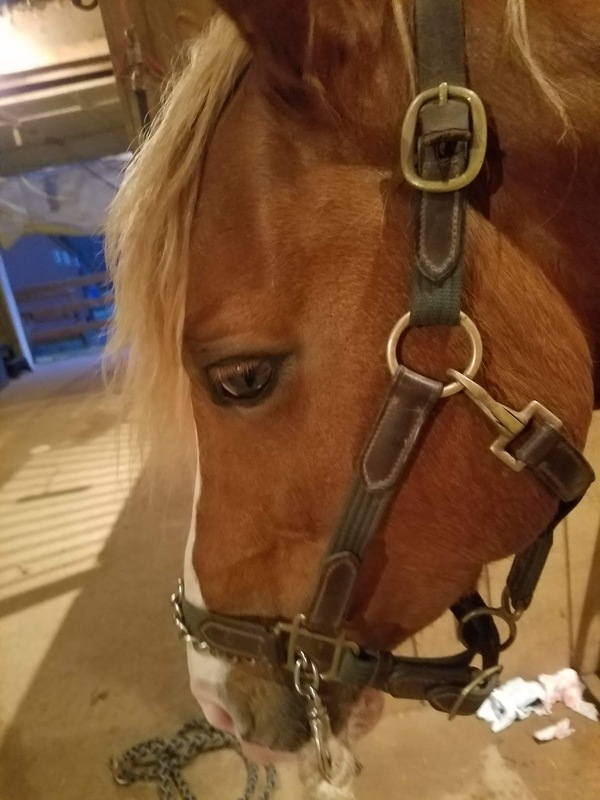 After I put on my barn clothes the rain had stopped and my pony did his super sad " I got wet" neigh. He trotted up to me and I saw red. And I don't mean his chestnut coat. Just behind his chin was a flap of skin and a fair amount of blood. It definitely looked like it was big enough to need a vet. I put in a call to have Mom call me. She was having the worst thoughts by time she called me back. Thankfully I could tell her it was not life or death. She agreed I should call a vet. 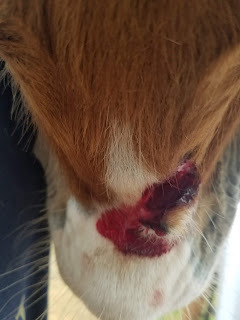 I sent the vet pictures and they said they would be out to suture. 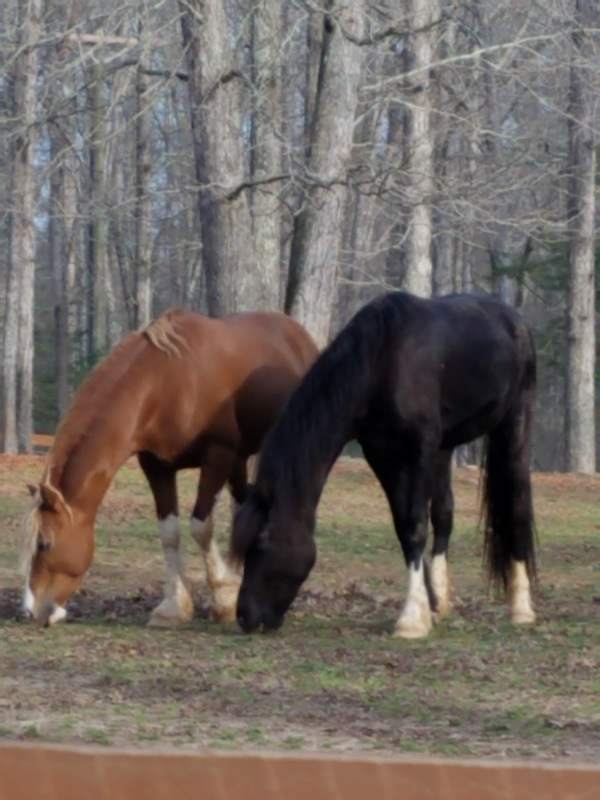 The vet said stallions are cheap dates when it comes to sedation. Roscoe was not interested in the needle and required a chain to cooperate. The vet was nice and kept the needle in while he switched syringes of medicine. He got banamine, antibiotics, and his happy juice cocktail. Once he was snoring he got one more poke of tetanus. Then the wound got cleaned, a close shave and some local numbing. All the injectables and cleaning solutions cost about $200. Then came the stitches. He used a stronger thread since the area has some movement. 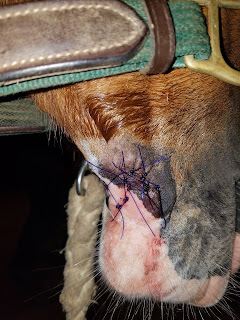 Amazingly it took seven stitches and after looking at it again he added one more. I was impressed he was able to line up the different skin colors. Roscoe will still have his good looks. I guess the plastic surgery was worth $150. Oh and since it was after hours the farm call was $155. Which was $45 cheaper than they told me via text. Small favors. Tomorrow we will see how Roscoe likes PEMF. 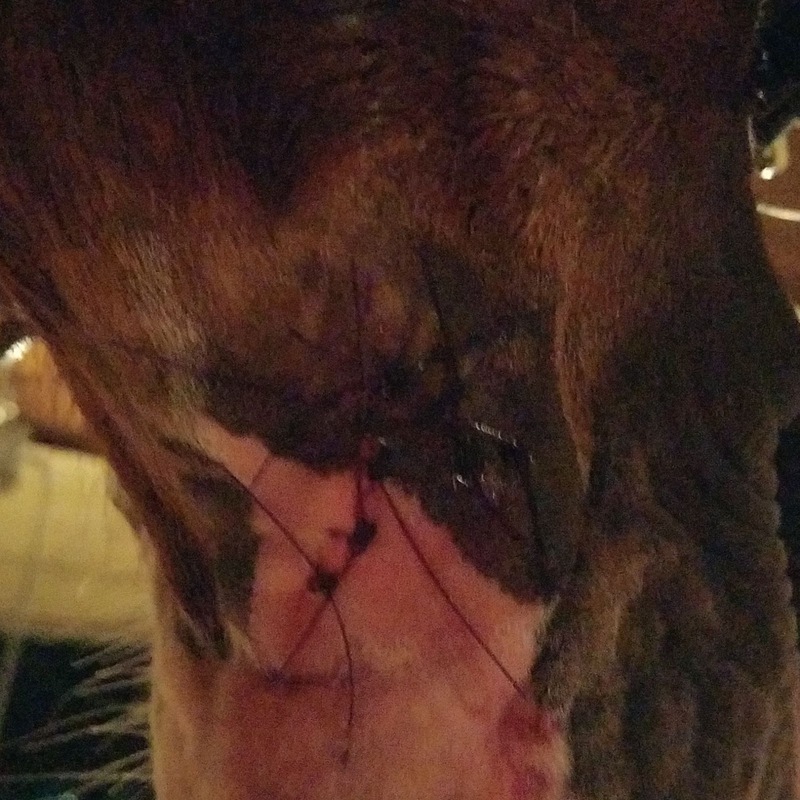 Hopefully it will help him heal faster. More than likely he was eating grass on the other side of the fence and pulled back to quickly and caught himself on a rough edge. 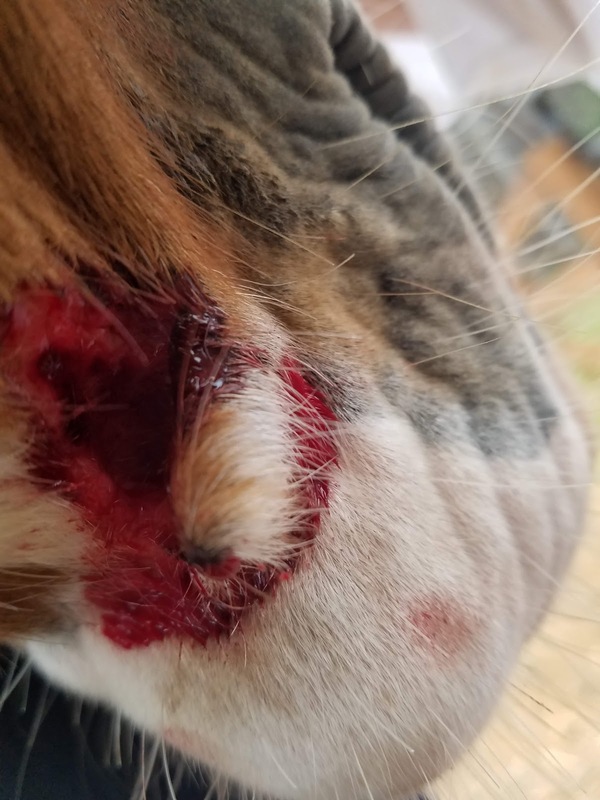 The vet said it was not very deep despite how it looks. 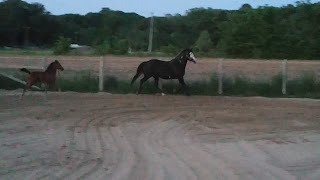 My pony will live, always a good thing. And the new vet was awesome. I may be in pain from the bill and exhausted from the late night, but I will keep those in mind. Come on foals! I need a baby fix to take my mind off money pain. oh no! I'm glad that it was not more serious. But still. yikes. That looked gnarly! 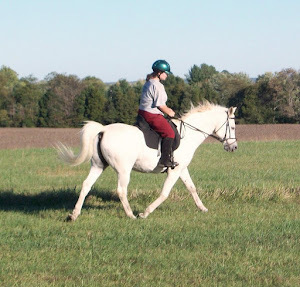 Horses never fail to find the most random ways to maim themselves. 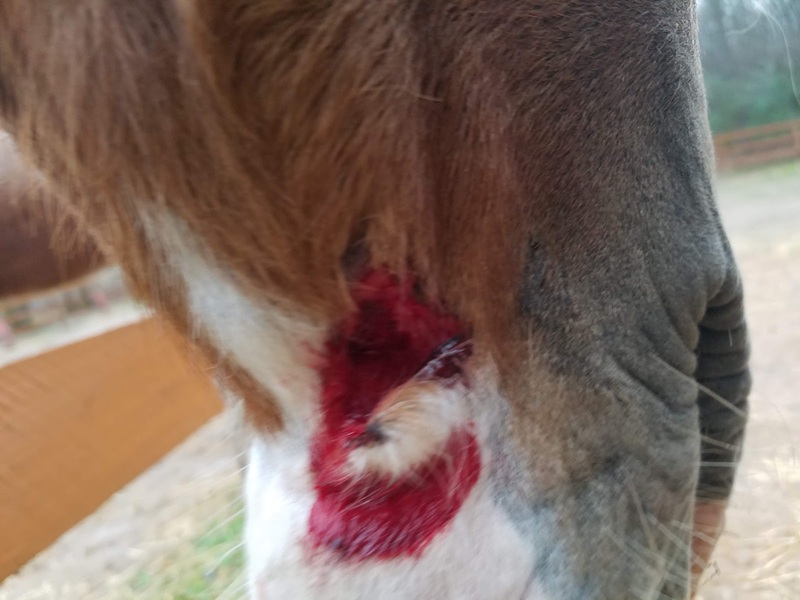 Holy cow - that's an ugly wound. Looks like your vet got it sorted out well. Fingers crossed for speedy healing! Ugh, horses! Glad they were able to patch him up quickly. Poor guy.